I love soup. Fond as I am of a good loaf of bread, I’ll take a bowl of soup over a sandwich any day. Soup is the perfect vehicle for those of us who cook without a net; it’s a great place to improvise. I make soups year-round and freeze them in individual portions. I work at home, so it’s great to be able to grab a jar out of the freezer at lunchtime. This particular soup has been an evolution. My sister-in-law Julie gave me a recipe for ham and wild rice soup that was delicious, at least in part because it called for a lot of dairy, including quite a bit of cream. 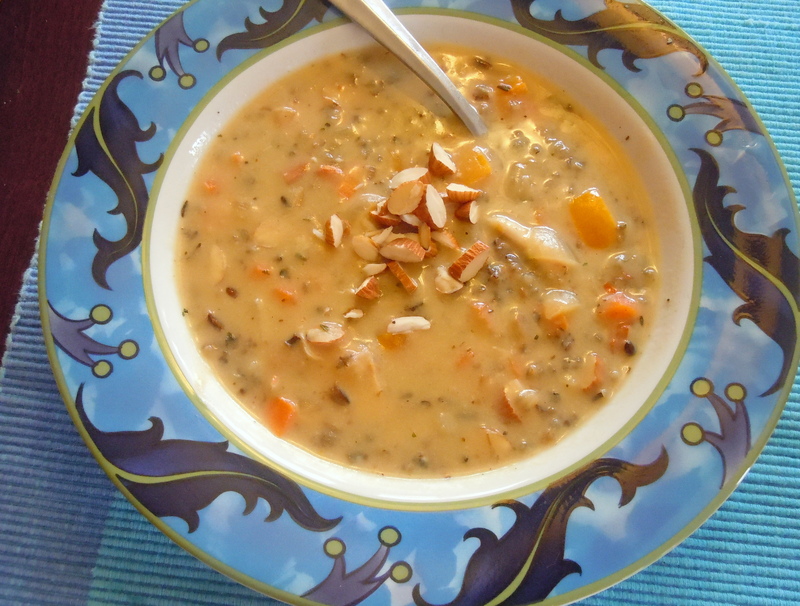 A few months later I had a similar creamy wild rice soup that contained the surprising crunch of slivered almonds. This one used half-and-half instead of heavy cream, but still had a stick of butter—too much for the guilt-o-meter. I believe I’ve mentioned before that my personal rule is that I’ll eat all sorts of decadent, calorie-laden food at restaurants, but at home I try to healthify it up. So I adjusted, altered and tweaked until I came up with this version. Now to get rid of that evil cream*. Whole milk thickened by a flour-butter roux kept the velvety texture but lowered the fat content. Stock added flavor and greatly lowered the calories. In our house we’re not thrilled with a bowl of tasty liquid with a few tasty bits floating in it; we like our soup to have substance (which means nearly a stew). If you like a more traditional soup, add more liquid. Both of the original soups had carrots, which we liked; adding bell pepper boosted the sweetness and the nutrition, and looked darn pretty to boot. As far as the protein was concerned, there’s nothing wrong with ham in this soup; I just liked the chicken better. Almonds are unexpected in soup. Blanched, slivered almonds look like shreds of chicken, so the almonds are even more of a surprise. You can use leftover cooked chicken, but sautéing the heavily seasoned tenders in the soup pot adds a lot of flavor. Even my husband likes this new “healthy” soup. Not that Tom isn’t a nutritious eater, it’s just that he’d been very fond of the rich and decadent versions. 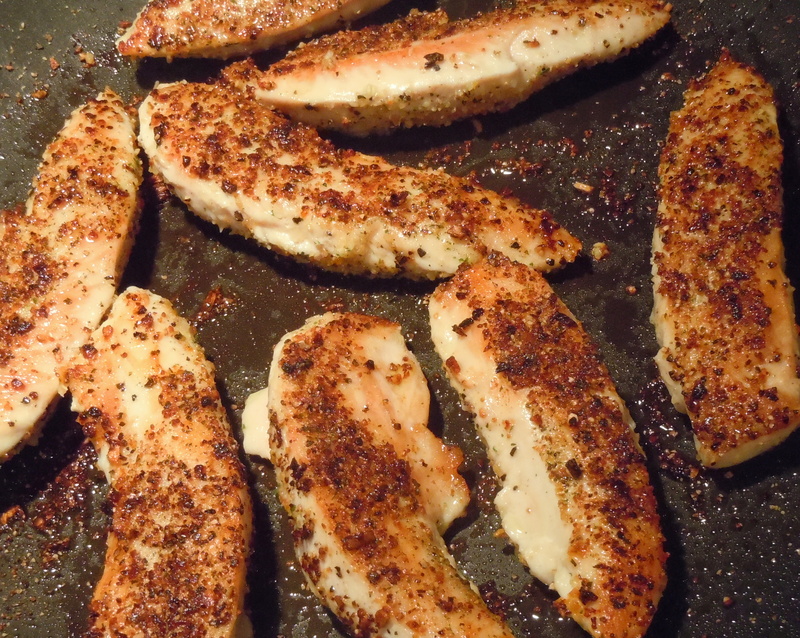 Season the chicken pieces well with salt, pepper and poultry seasoning. Sauté in a stockpot with the oil over medium-high heat until they’re well browned and cooked through, about 4 minutes per side. Remove the chicken and set aside. Add 2 tbs. of the butter to the pan. Add the onion, carrot, bell pepper, and garlic; sauté for 5 to 7 minutes until the veggies are softened. Add 2 tbs. of the flour and stir until incorporated; cook for 2 minutes. Stir in 5 cups of the stock. 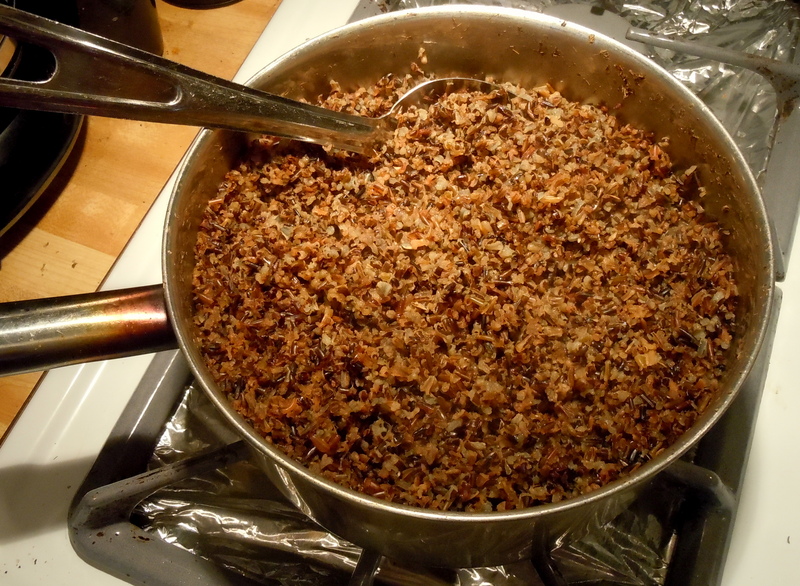 Add the wild rice and simmer for 15 minutes or so. Meanwhile, melt the remaining 1 tbs. butter in a saucepan over medium heat. Stir in the remaining tbs. flour and cook for 2 minutes. While the flour cooks, heat the milk in the microwave until it’s warm, about 1 minute. Whisk the warm milk into the flour-butter roux and cook until it’s smooth and thickened. Whisk in the cheddar until it’s melted into the milk. Stir the cheesy sauce into the soup and heat through. Shred the cooked chicken and add along with the almonds just before serving. Add extra stock if the soup is too thick. This entry was posted in main courses, pasta, rice, and grains, soups and tagged almonds, carrots, cheddar, chicken, soup, wild rice. Bookmark the permalink.